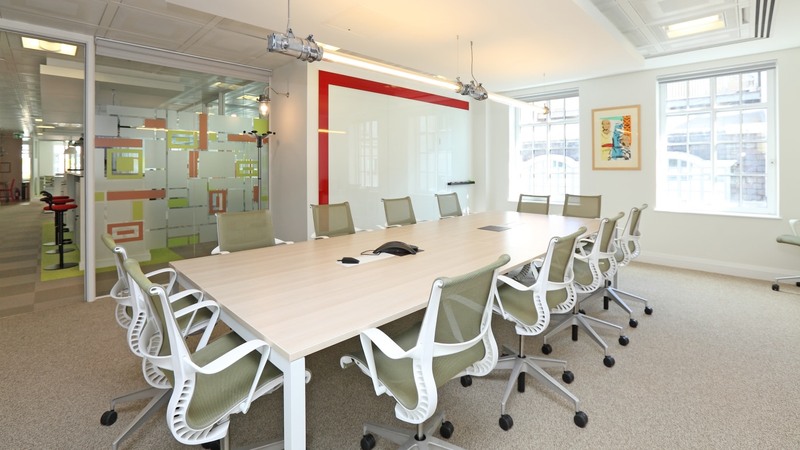 Light, bright and with pops of primary colour, the interior scheme of the Entrepreneurs Fund - an enterprise supporting businesses with financing and support – is designed to inspire bright ideas. Located just off Fulham Road in London, the bespoke fit-out was completed by corporate specialists Woodalls Design and features a range of skinflint lights throughout. Green pendant lights - salvaged from a WWII M.O.D bomb factory in South Wales - and white enamel shades hang above a heightened island desk unit. Also illuminating a long desk are two vintage industrial fluorescent lights originally from a factory in the Midlands, while a cluster of three 1950s Revo pendants make a statement above a table in the social kitchen area; all designed to encourage impromptu meetings. Elsewhere green machinist lights by Revo contrast against the red walls. The result is a clean and bright aesthetic in which to get down to business.